KOOLTRONIC, INC., of Pennington, NJ, the leading manufacturer of air conditioners, heat exchangers, fans and blowers for electronic enclosures, is making its New Jersey operation an example of environmentally-friendly industrial practices. These efforts include converting our Corporate Headquarters and manufacturing plant to solar power, using ozone-friendly refrigerants and recycling to help protect the environment. Kooltronic has always enjoyed a proud tradition of engineering and producing the highest quality products available while maintaining environmentally-friendly industrial practices. As an example of this commitment, Kooltronic installed over 2,600 solar energy panels on the roof of their facility during the summer of 2006. At the time of construction this solar power system was among the largest commercial installations in New Jersey. With the addition of 1,300 solar panels over the parking lot, Kooltronic receives 90% of its electricity from the sun. 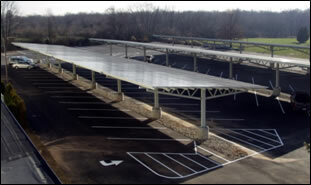 In 2011, Kooltronic installed a canopy of approximately 1,300 solar panels over the parking lot, accounting for 30% of the energy requirements needed by the facility. 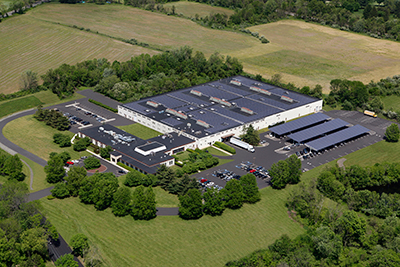 In conjunction with the rooftop installation of 2,600 solar panels which produce approximately 60% of our energy requirements on any given day, Kooltronic's facility receives 90% of its electricity through solar power energy. Solar power needs no fuel and produces no waste or pollution. This independence from non-renewable energy sources is an example of Kooltronic's dedication to 'green' technology, and evidence that it is an environmentally-friendly organization with an eye toward the future. Prudent foresight on the part of government and industry has led to laws and refrigerants that will help reverse the damage to the ozone layer; and by international treaty, as of 2015, the manufacturing of air conditioning equipment with R-22 refrigerant has become outlawed. Kooltronic was among the first manufacturers in the industry to use ozone-friendly R-134A refrigerant in its air conditioners. Since 1992, Kooltronic has used R-134A in all of its air conditioners for which R-134A compatible compressors are commercially available. Kooltronic also uses R-410A refrigerant for compatible compressors. Kooltronic recycles office paper, soda bottles and cans, as well as scrap metal left over from the manufacturing process. Reducing waste through these efforts helps the environment by conserving resources and energy. Kooltronic has made recycling a routine activity in both manufacturing and administrative activities. As a "green" step, Kooltronic utilizes a closed, recycling powder-painting system that captures and reuses particulates from the powder-painting process, preventing their release into the environment. Powder coating processes are universally accepted and specified as the Best Available Control Technology (BACT) to reduce air pollution primarily because no VOC (Volatile Organic Compounds) emissions are released into the atmosphere. Since no solvents are used as any part of the powder paint process, concerns about ground water, air quality or hazardous waste are eliminated. Except where noted, Kooltronic products are in compliance with European Economic Union (EEU) Reduction of Hazardous Substances (RoHS) Directive 2002/95/EC, except for the exemptions listed under the RoHS Directive. For information on high quality Kooltronic cooling products, please call (800) 321-KOOL.